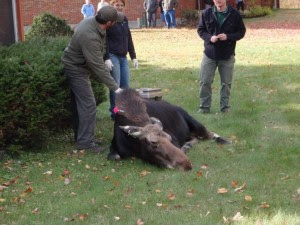 The resident (and famous) large mammal biologist will deliver his popular "Moose In The Adirondacks" presentation this Saturday evening at 8:00, at the High Peaks Information Center at the Adirondack Loj, in Lake Placid, NY. 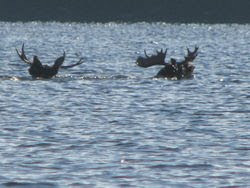 If you have always wanted to know if moose have webbed feet for swimming across Lake Champlain, or how much moose eat in a day, New York State Department of Environmental Conservation (NYSDEC)Biologist, Ed Reed, will be happy to answer these and any other absurd questions you or I might have. He will also discuss and explain the exciting, current recolonization of moose in New York State. Ed is picture above with the Saratoga race track Mrs. Moose he lulled to sleep in order to facilitate her relocation last spring. I can give you a little preview of his talk by confiding I am not sure about the webbed feet, but I know some of our Adirondack moose residents actually did swim over from Vermont. See below. The Adirondack Loj is owned and operated by the Adirondack Mountain Club, and is located just outside of the Village of Lake Placid at the end of the Adirondack Loj Road. It is a lovely spot on Heart Lake, nestled in the Adirondack Mountains and highly recommended by this writer.